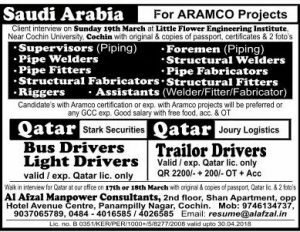 Recently we have posted latest Job opportunities in Saudi Arabia. Aspirants who are Interested can visit this site and go through the latest Job Employment details. Aluminum Foil Containers in Saudi Arabia Urgently requires Aluminum Foil Containers Press Machine Operator- The Operator Should have a Min of 3 Years Exp. in Operating automatic Aluminum Foil Containers Press Machine. The qualification required for this Machine operator Post is Diploma or Equivalent. The Operator should have to Speak English language. Electric Forklift Operator- The Operator Should have a min of 2 Years Experience in Operating forklift, preferred electric forklift. The Operator Should be able to Speak English language. 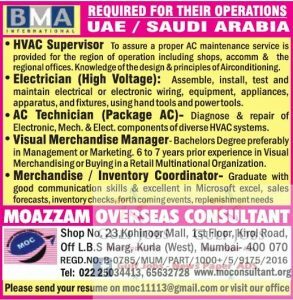 Technician jobs in Saudi Arabia: RNMA REQUIRED FOR THEIR OPERATIONS UAE SAUDI ARABIA HVAC Supervisor To assure a proper Ac maintenance service is provided for the region of operation including shops, accomm & the regional offices. Knowledge of the design & principles of Air conditioning. Electrician (High Voltage): Assemble, install, test and maintain electrical or electronic wiring, equipment, appliances, apparatus, and fixtures, using hand tools and power tools. AC Technician (Package AC)- Diagnose & repair of Electronic, Mech. components of diverse HVAC systems. Visual Merchandise Manager Bachelor’s Degree preferably in Management or Marketing. 6 to 7 years prior experience in Visual Merchandising or Buying Retail Multinational organization. Merchandise Inventory Coordinator- Graduate with good communication skills & excellent in Microsoft excel, sales forecasts, inventory checks forthcoming events, replenishment needs MOAZZAM OVERSEAS CONSULTANT Shop No. 23 Kohinoor Mall, first Floor, Krol Road. off LBS Marg. Kuria (West Mumbai- 400 070, Tel: 02225034413, 65632726. Please send your resume on [email protected] or visit our office. Candidates must be Kuwait return or in India with gulf experience. * Should have ITI Diploma in Air conditioning. * Should have minimum 3 years experience in Air conditioning. 2 ## Lift (Elevator) Technicians Kuwait return or (from India) with gulf experience. * Should have ITI Diploma. * Should have minimum 3 years experience in same field. 3 ## Winding of motors pumps Technicians. – SALARY 150 kd to 180 kd (depend on experience). – The weekly holiday (Friday). – Over time as you like.